Wolves Heroes » Blog Archive » Floyd Found, Got Gary! 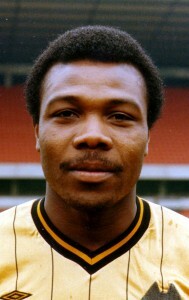 Floyd Streete in the 1980s. Former Wolves favourite Floyd Streete, so often the elusive link in reunions of the club’s 1988 Sherpa Van Trophy winners, has finally been tracked down again – to a highly desirable new location in the Caribbean. The powerful central defender is coaching in the Cayman Islands, where he has had a chance meeting with Martin Waud, a Wolves fan from Kinver who has worked in the area for the last few years as an accountant for Price Waterhouse Coopers. And, in a double coup for the organisers of next month’s 20th anniversary get-together of Graham Turner’s Wembley winners, www.wolvesheroes.com has traced Gary Bellamy in Essex. The Cayman Compass newspaper reports that Jamaican-born Streete is coaching the Seven Mile Sporting Club, whose season starts on September 1 and runs until just before Christmas. He had been living in the Buckinghamshire area for many years and was delighted when his whereabouts were rediscovered by his contemporaries in 1996 in time for him to be invited to a night-out staged for the lower-division double title winners at the Kingfisher Club in Wall Heath. Ultimately, he couldn’t attend but did subsequently return to Molineux on a match night and was warmly received when the players walked round the pitch before kick-off. “Martin signed up for a local team soon after arriving in the Cayman Islands and has since gained residency and even made it into the national team,” said Richard Evans, a friend and fellow founder member of Stourbridge Wolves Supporters Club. It isn’t yet clear whether the 49-year-old – known by Wolves fans as Bruno – will be able to attend but Martin said: “I spoke to him a couple of weeks ago to tell him about the Sherpa Van Trophy dinner after the story appeared in the Express & Star. He said he was more than happy to speak to people about the event. 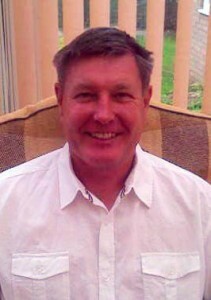 Gary Bellamy at home this summer. Bellamy’s return to Molineux for the night of Thursday, September 25 has been secured, though, after help from Mark Venus and radio reporter John Bastow led a path to his family home in Braintree. He played around 140 matches for Leyton Orient following the end of his 165-game Wolves career in 1992 and subsequently managed Chelmsford, Dover and Braintree. He also served Chelmsford as commercial manager and chief executive. A stint in the leisure industry in Hackney and Braintree followed before the tall central defender or right-back embarked on his present job in social housing in Chelmsford, working hand-in-hand with community groups, police and landlords to improve residents’ lives. “I don’t miss football management at all,” he said. “I’m playing golf again and also cricket for a village team. As at Wolves, we’ve had a couple of successive promotions and I took seven slip catches in one match but we’re finding it harder this season. 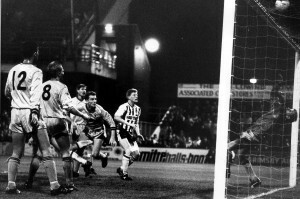 Gary Bellamy (background) watches Mark Kendall save magnificently in Wolves' FA Cup tie at Grimsby in November, 1988 - the side's only defeat in a nine-game run that brought them eight wins. *Tickets for the SVT reunion dinner at Molineux on September 25 are available by e-mailing sales@underthepostsltd.co.uk or by ringing 08456-800906. Posted on: Tuesday, August 19th, 2008.